Subtitled “songs from the great Talking Pictures Musicals, 1929-1939”, this recording was made in 1990 and released in 1991 by Shadowland Music Rialto Recordings. I don’t know if it sold many copies or not, but one thing I know, it should have been a hit! Like they wrote on the CD sleeve, “once you entered this world, the harsh realities of the Depression were mocked – or more often simply forgotten – by the happy-go-lucky denizens of the talkies”. And believe me, this is a different world, where a simple melody lift-up our heart and a contagious rhythm make us tap. The fact that we’re living in another Depression era makes this even more important. Unfortunately, today the talkies don’t give us this kind of songs, but thankfully we can travel back in time and listen to these old wonderful tunes. There are 28 tracks here and all of them are a pleasure to the soul. Things start with Paige O’Hara singing a delicious melody of “Good Morning Glory” and “Sing Before Breakfast” and end with Kevin McMahon “Sweepin’ the Clouds Away”. My favorite track is the amusing “Give Her a Kiss” that Rodgers & Hart wrote for the movie THE PHANTOM PRESIDENT; here it’s sung by Ann Morrison, who also has a terrific time with “I Love to Walk in the Rain”. Gordon Goodman manly delivers “One Song” from Disney’s SNOW WHITE AND THE SEVEN DWARFS. Another highlight is a Harry Warren & Al Dubin medley sung by Gregg Edelman, George Dvorsky and Kevin Ligon. 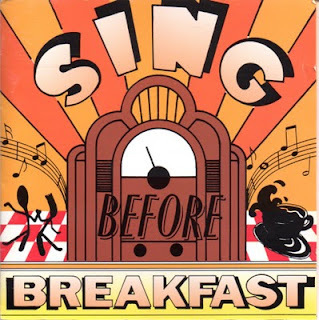 There are many more enjoyable and, sometimes, forgotten songs here, and they are all sung by a terrific cast that includes Randy Graff, Jason Graee, Diana Canova, Rebecca Luker, Greg MacKellan, Adam Gruper and Anna Marie Gutierrez. This album is a little jewel, with plenty to discover and it should be part of every musical fan CD library.